I mentioned last time that I really love seeing what other people really eat because I am nosy and it gives me ideas. That's the reasoning behind these posts and I hope there are other nosy people out there like me. Our kitchen is all but done now - we have several little things still to do, but it is a fully functional kitchen as opposed to last time - so this is more normal for us. 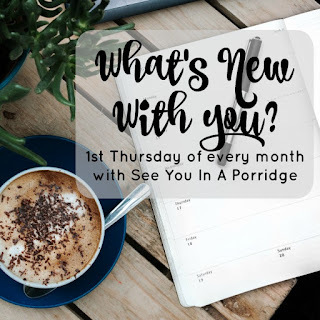 I love convenience foods as much as the next lazy person, but we got a bit too comfortable with them during our kitchen renovation. A few notes about the way we eat before we get started: I do not love meat. I don't hate it, but most of the time I am happy without it. KC and I are both picky, but about different things and it's hard to find something we both like. We tend to eat the same things over and over because of this, but I am trying to branch out to add more recipes to our arsenal. We don't eat pigs. Ever. Because I love them. 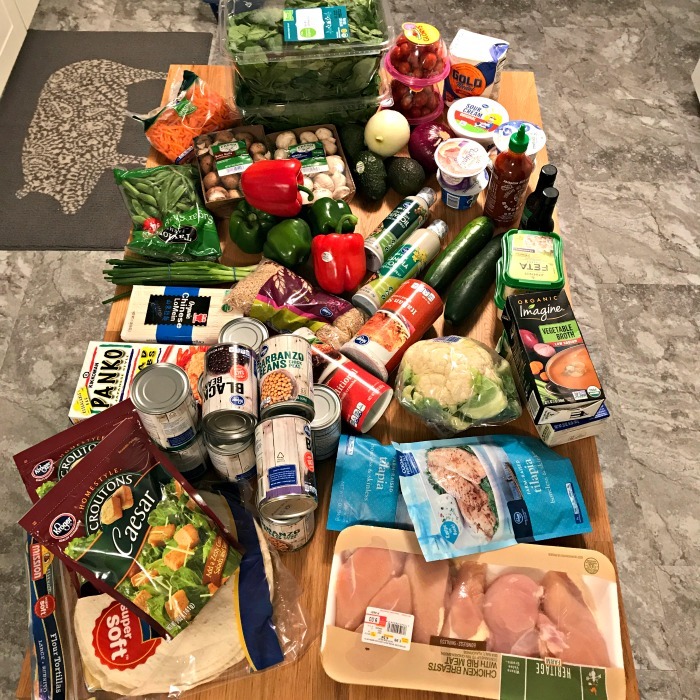 I am still trying to conquer meal planning and get our grocery budget down. However, when I grocery shop, I don't buy just for the week ahead. I utilise what we have in the pantry, fridge and freezer, then I buy the things I will need + things I don't need just yet. We never 'need' black beans, chickpeas, wraps, rice, etc but I buy them before I need them because my life would end if we ran out. Ha. I am a hoarder when it comes to food and it makes me happy to see an overflowing pantry. Half of me wants to be one of those people that buys everything for the week on Sunday and uses all of it, but half of me can't imagine not having all of those things already, you know? So sometimes our grocery budget is more than we actually use in a month, or less. Anyway. Like I said, I'm still trying to figure it out and meal planning properly is definitely the first step in getting the grocery budget down I think. KC - egg muffins. Kale, (turkey) bacon, onions and garlic. Me - avo on toast - I planned to have this every day but then a department got chick fil a for everyone on Friday, and I mean..... I ate it. KC - Tuesday & Wednesday he had this 'enchilada bake' - I make it without meat and add turkey or chicken for him. This time turkey. There are a bunch of recipes out there but I just throw it all in the crock pot on low (with quinoa on the bottom so it cooks properly). I think he added spinach or kale to these meals, I wouldn't do that personally. Thursday & Friday - chicken, veggies & quinoa with tzatziki sauce (greek yoghurt, cucumber + dill). I just cooked the chicken in the crockpot, it's my favourite lazy way to cook chicken for him. He ate out on Monday because it was a no student day, so they always eat out on those days. Me - salad all week! I had a really great salad a couple of weeks ago and had been craving it ever since. I like a lot of crap in my salads - spinach, carrots, peppers, onions, mushrooms, tomatoes, feta, croutons and craisins, topped with ranch dressing. I normally do cucumber and avocado as well, but I forgot the cucumber and didn't want to overdose on avocado all week. I actually really enjoyed having a salad all week, it wasn't exactly instantly filling like, say, pasta, (it did fill me up because it was a lot of food) but the bonus part was that it took quite a long time to eat, like at least 15-20 minutes, and normally my lunch is inhaled in less than 5. So I liked that I got more time to just eat and relax, even if it was at my desk. 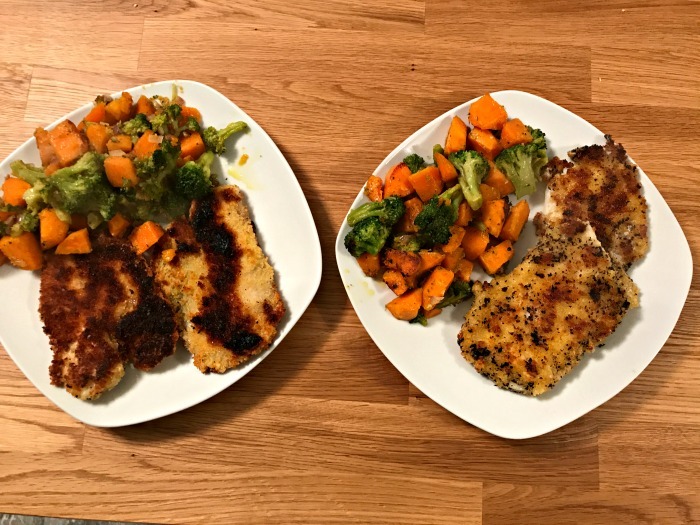 Panko crusted tilapia & veggies - what a freaking quick + easy Monday meal! Seriously, so quick. So easy. So simple. The veggies took longer than the fish. I got so hungry when I was making this that I gave myself 2 pieces of fish and could barely finish. We will for sure make this again. Huge hit and did I mention easy? lo mein + chicken for KC - I threw in some chickpeas because why not. I wanted to use bok choy but Kroger was out when I went shopping. Also I ruined the noodles and I don't want to talk about it. 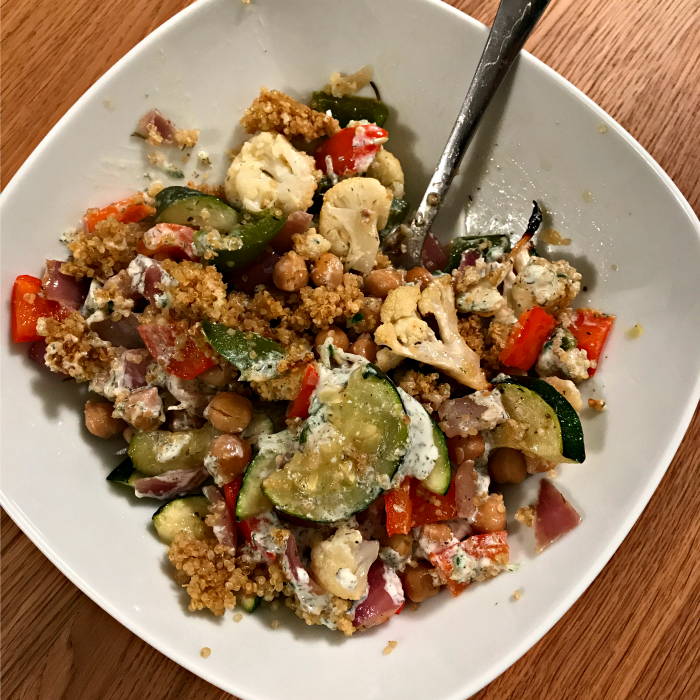 Veggie grain bowls with tzatziki sauce + chicken for KC - I loved this. KC was not a fan of the meal but the tzatziki sauce was a hit. He also got cranky when I tried to take a photo of his meal so just imagine the below with chicken. 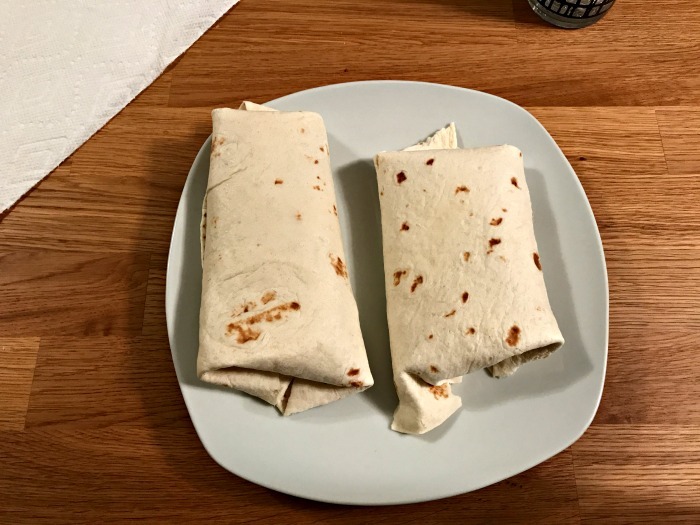 Turkey + black bean burritos - we call this taco mix but it's just turkey, black beans + taco seasoning. It's one of the meals I actually like the taste of meat. Burger & tater tots - I had a mushroom stroganoff (with turkey for KC) planned but we had plenty of leftovers and I ended up going out with a couple girlfriends I hadn't seen in ages. I had a burger and tater tots, along with several ciders. The bar has a bunch of old school games and we played a few because it was ladies night and we got free tokens. Score. The bar looks empty in that photo for some reason but it was packed. I think I was home by 11, my 30 year old self is so happy about that. No photos of the burger (oops) so these will have to do. Like last time, I am a creature of habit and am happy to eat the same thing for breakfast & lunch all week. I go through phases but I probably have like 5 options for each that I rotate through. I love looking at recipes on Pinterest as much as the next girl, but I feel like everything is so fancy or not realistic, you know? Like I want to see what people actually eat. I'm always looking for simple, easy, quick + healthy meals that can satisfy a non-meat lover + a meat lover who deadlifts 500lbs so he eats a lot. You know? If you have any - simple, easy, quick + healthy meals, please share! Your meals look yummy! I am the fussy one here - Jan will eat basically everything, except he's allergic to peanuts so obviously not them. I always have to have a tin of chickpeas in the cupboard. I would add them to everything if I could! I used to buy frozen chickpeas and they lasted a while but the supermarket stopped doing them. Booo! 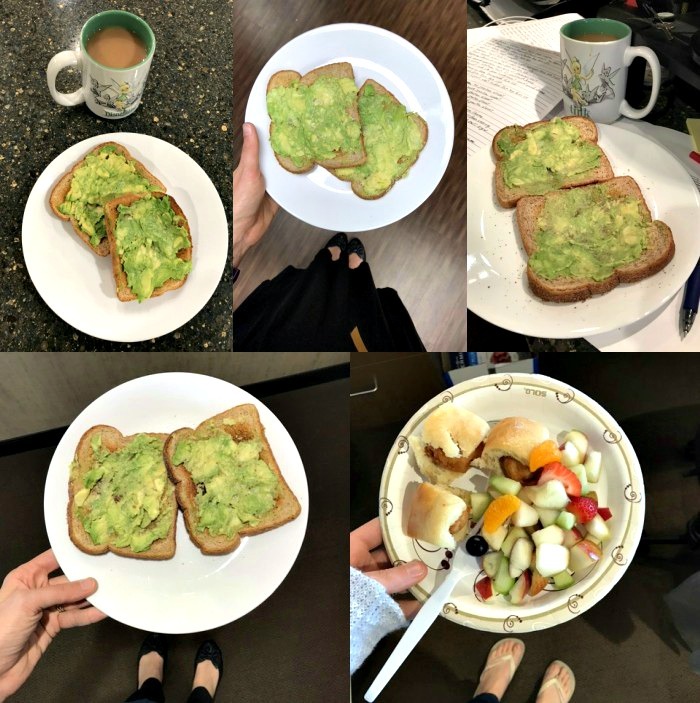 Mm, avocado toast for breakfast! I would totally eat that if avocados weren't so expensive here. I mean, everything is expensive but avocados are extra expensive! We do eat them relatively often but every day would bankrupt me. Haha. This is awesome. Love how you mix it up. When I prep meals I do one thing for lunch all week and one thing for dinner (and for Danny I cook something completely different most times because he cant just have veggies and meat or he'd die). I grew up on avo and toast but haven't had it in a while, these photos have me a craving for them. PS my pantry isnt stocked full but Im like you in that there are things I MUST have in there. At all times. Just in case. Teach me your ways! 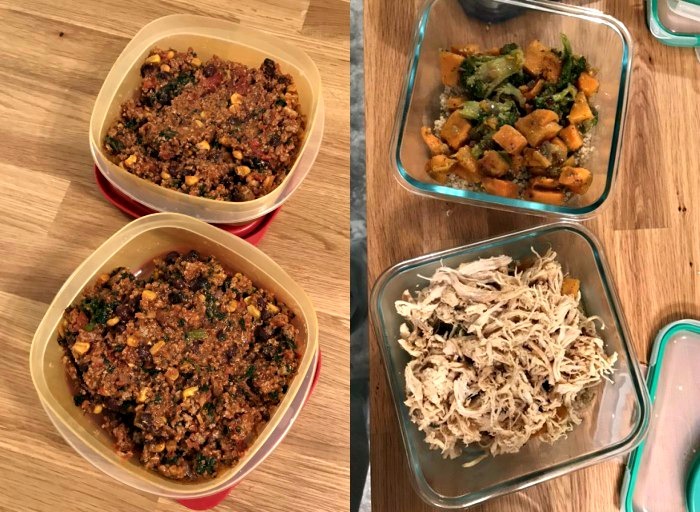 I'm failing so badly at meal planning and meal prep lately. I forgot how hard it is to cook for another adult. Also, I'm pretty sure avo on toast is literally the best ever. Keep posting these, woman! I love them! 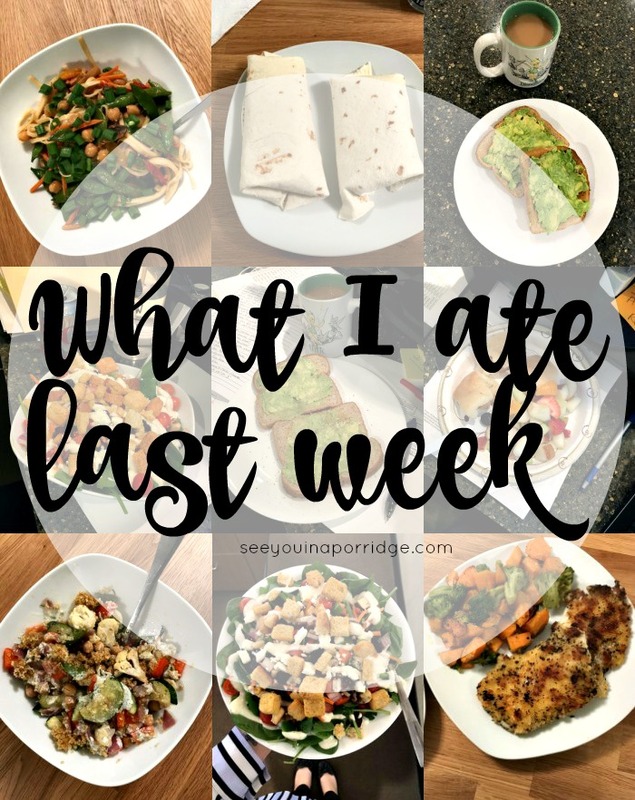 I love seeing what people eat during the week. If you want to make your salad more filling you could add some beans or nuts to it! That would give you some protein as well :) I also love having huge salads for lunch..easy to prep and tastes great! I probably say this every time, but I love these kinds of posts! Your salads looked soo good and so fresh. Did you just put them together each morning, or did you make them in advance? 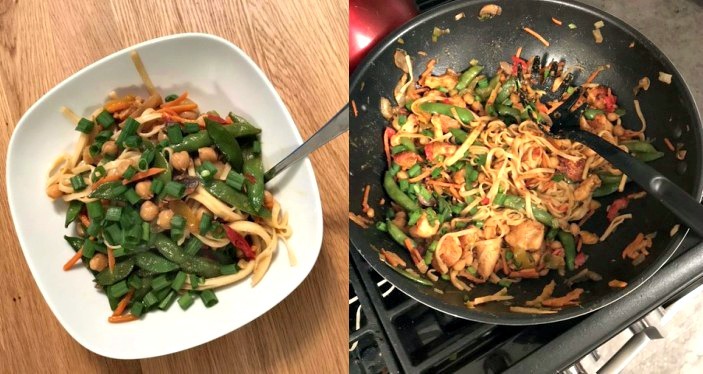 We do a lot of stir fry, but always just use rice- I need to try one out with noodles sometime because it looks so good! Well I am super nosy and curious about what people REALLY eat so I loved this!! I am firmly on team "lots of crap on my salad" so those sound pretty great to me. I need to do salad for lunch more--I tend to forget about them. And your dinners sound so good too. I love anything with tzatziki sauce! Your dinners every night looks SO good. I need to learn to make fish. 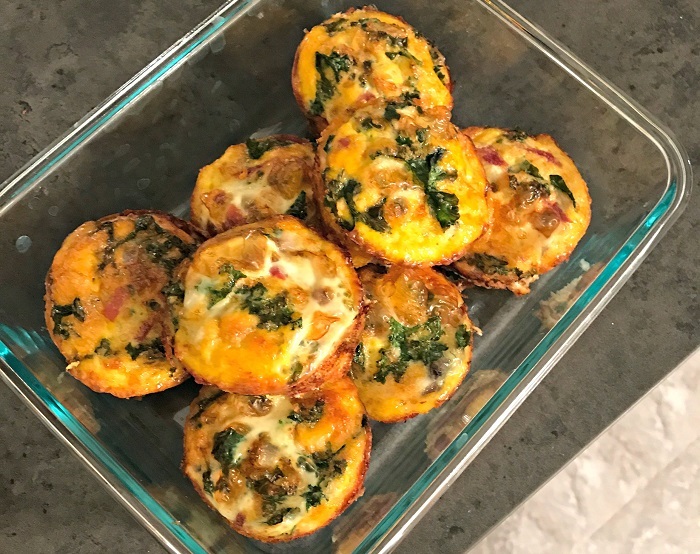 The egg muffins look delish for breakfast and I love all the different variations of veggie and salad bowls you whipped together! I like how you do your salads!!!!! YUMMM! I honestly could eat avocado toast every day of my life!!! I'm with you on not knowing what to make sometimes because things just seem way too difficult to make or have weird ingredients. I do like meat though; I'm not sure what I'd eat most of the time if I didn't (but omg, I couldn't stop looking at that pig gif - so cute!!!) I really like breakfast foods - anytime of the day, I'll take it. I'm also someone who tends to eat the same things all the time. I'm officially starving after reading this and I love how much inspiration you have given me for some new meals! All those salads look delicious! I find these posts so interesting, too! All your salads look delicious! Mine lately have literally just been lettuce. Too dang lazy to make one with all the goods, haha. 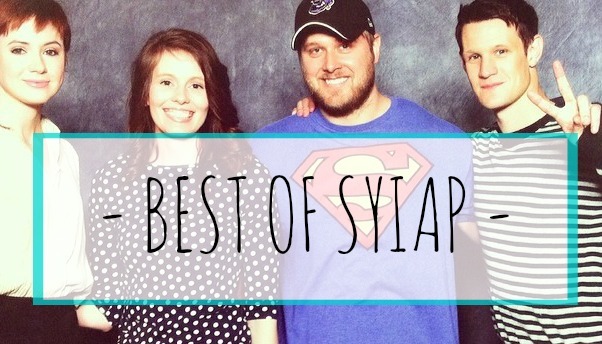 If I ever blogged again, I would want to talk about this. It IS interesting. We are the opposite and can't eat the same foods on repeat, so planning meals is SUPER hard. Especially because Andrew goes out for lunch daily so staying away from what he has had for lunch and dinner lately is a huge challenge! I'm totally with you on wanting to have quick and easy options for our meals throughout the week. I'm definitely not the best cook out there, so I have to have something easy, but Chris can get pretty fancy sometimes when he's cooking, which is probably why he cooks way more than me. And I wish that I could stock up on food, but my problem is that I always forget what we have and what we don't have, and I'd probably forget that we had stuff in the pantry and then it'd go bad. This is pretty similar to how we eat and I have that roasted veggie bowl pinned right now. I'm super nosy as well, so I enjoy these posts! I like this kind of food! I'm exactly like you in that I go through phases with my food. I'll eat the same thing for breakfast for about 6 months until I get tired of it. I agree - I love this kind of post. Thanks for putting it together! Your meals look yummy - especially that salad! I eat alone most nights because of Ryan’s schedule, so I know what you mean about eating the same things all the time. It’s just easier not to think about it. I just got some frozen eggplant thing from Aldi that I can’t wait to try! All of your meals look so good! I definitely eat the same thing for breakfast every day (baked oatmeal with fruit and some kind of nut/coconut butter) but then switch up everything else. I feel like you eat way healthier than I ever could lol! And after the week of crap eating we had wow. I need a detox! We are constantly trying to figure out how to get our grocery budget down. I have a list of things I keep in the pantry on hand regardless if we are using it for that week or not. And certain condiments that are always in our refrigerator too. But other than that, most of our Sunday shopping is for just that week and we use it all. 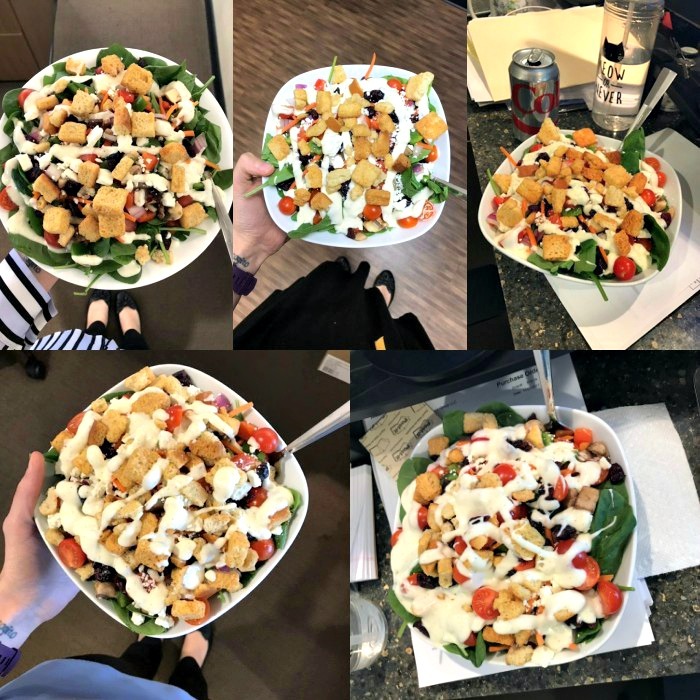 Your salads look so good! And I make a similar enchilada bake that I need to whip up again soon. Super late comment here but I loved this! 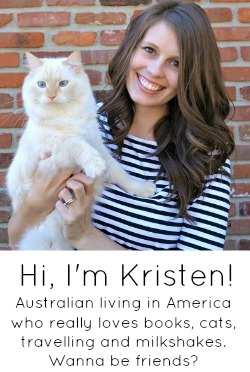 I'm so nosy and I love seeing what people *really* eat (not instagram eat). I would pinch the idea for myself but lately we've just been buying 1kg of salad from Costco then throwing a bunch of veg/rotisserie chicken on and calling it a meal. Similar effect to your lunch salads but mine are a lot less interesting! On the plus side it makes meal planning easy, because it's always the same. I'm sure I'll get sick of it soon but it's working for now.